American Journal of Translation Studies, ISSN1947-4679(Print); ISSN1947-4687(online); is jointly published quarterly in March, June, August, and December for a total of 4 issues per year by APC Center for the Study of Languages and Cultures and American Academic Press, with offices at 2038 S 1500 E, Salt Lake City, UT 84105 USA. On the web at http://www.AcademicPress.us. American Academic Press is an independent scholarly press specializing in monographs, revised dissertations, primary sources, textbooks, and other books reflecting scholarship in the both natural and social sciences and, also publishes academic journals. Subscription Rates for Volume 11, 2019: Print ISSN1947-4679. Institutional subscribers: US $ 390; Personal subscribers: US $ 280. Delivery Terms and Legal Title: Prices include delivery of print journals to the recipient's address. Delivery terms are Delivered Duty Unpaid (DDU); the recipient is responsible for paying any import duty or taxes. Legal title passes to the customer on despatch by our distributors. Copyright © 2019 by American Journal of Translation Studies and American Academic Press. With the exception of fair dealing for the purposes of research or private study, or criticism or review, no part of this publication may be reproduced, stored or transmitted in any form or by any means without the prior permission in writing from the copyright holder. Authorization to photocopy items for internal and personal use is granted by the copyright holder for libraries. Submitting Copy: Copy should be submitted electronically where possible to the Publishing Editor, manu@utah.usa.com. (Microsoft Word is preferred). In order to ensure that your manuscript conforms to journal style, please consult the "Instructions for Contributors", which can be found at http://www.AcademicPress.us. (Please remember that we review "blind", so that neither authors or reviewers know each others' identity. To this end, please do not identify yourself, your colleagues, or institution within the submitted files; instead, give your details during the submission process.) All correspondence will be by e-mail. A completed submission is confirmed by e-mail and your paper will then enter the editorial process. When a decision is made, we will contact you immediately. We generally accept submissions of original translations into English of short stories and poetry, as well as scholarly essays dealing with Translation Studies at special issue every other year. Disclaimer: The Publisher and Editors cannot be held responsible for errors or any consequences arising from the use of information contained in this journal; the views and opinions expressed do not necessarily reflect those of the Publisher and Editors, neither does the publication of advertisements constitute any endorsement by the Publisher, and Editors of the products advertised. 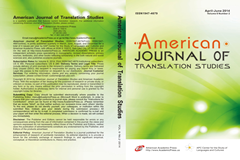 Editorial Policy: American Journal of Translation Studies is a journal published for the enhancement of research of worldwide translation. Its editorial objective is to provide a forum for the scholarly exchange of research findings in, and significant empirical, conceptual, or theoretical contributions to, theory and practice.